UNT helps first-year students adjust to college life, develop academic skills and discover their career path. UNT helps students transform their lives. Talon is expanding UNT's reach in computation-based research. Members of the Class of 1962 share their memories. 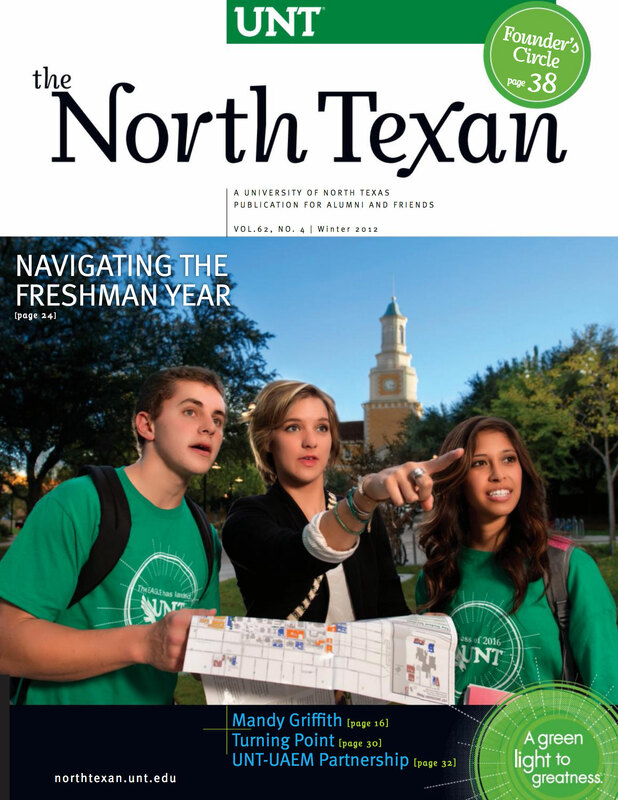 Students discover new career directions after transferring to UNT. As a federal prosecutor, UNT alumna Mandy Griffith is combatting the exploitation of children. Two universities mark 10 years of research collaborations and cultural exchange. Founder's Circle recognizes donors whose contributions have a profound impact. UNT campus enchanted by many events. Mean Green soccer team, Green Brigade Drumline win big accolades. Design professor and his family live in Honors Hall to help students adjust to life away from home. UNT alumna Amy Tuley performs with prestigious Los Angeles modern dance company. The Mean Green basketball teams will have new amenities. UNT student veteran saves a fellow soldier's life, sets an example for others to follow. Journalism alumni remember a favorite teacher -- Pop Shuford. UNT recognizes outstanding faculty for their contributions as teachers, scholars and mentors. Readers remember snow, a memorable celebration and marching in the parade. UNT football standouts Craig Robertson and Lance Dunbar are now part of the NFL. Reader ponders legacy of her grandfather, former UNT President Robert L. Marquis Sr.
UNT alumnus Craig Broeder cycling for cancer research -- and breaking records. UNT alumna Melissa Rycroft danced her way to an all-star win. UNT alumnus Bob Belden's CD features young UNT alumni and students. UNT alumna Leah Hatfield stays active on campus with new group. UNT alumnus Michael Bise wins $50K Hunting Prize for artists. How can you safely shop online during the holiday season? UNT students attended the Group for International Design Education conference in Scotland.